The House of Representatives dealt a setback Friday to the Obama administration bid to close the detention center in Guantanamo Bay, Cuba, and send terror suspects to a prison in northwest Illinois. Lawmakers adopted a measure to bar the use of funds in the National Defense Reauthorization Act to transfer or release terror suspects from Guantanamo. The vote was 282-131, with Democrats split. Obama vowed to close Guantanamo within a year of taking office, but has missed the deadline. Obama has been told time and again that we don’t want the terrorist on our soil, when will he learn to listen to the American people! Yet another Obama problem of what to do with the Gitmo terrorist. Why not a military trial at Gitmo Obama? Some Democrats have joined in calling for Homeland Security Secretary Janet Napolitano to step down following the attempted bombing of a Northwest Airlines flight a week ago. Not only does her department oversee the Transportation Security Administration, but her initial claim Sunday that “the system worked” was widely ridiculed and interpreted by critics as a sign that she’s in over her head. Some Republicans, who’ve taken issue with her in the past for calling terrorist acts “man-caused disasters” and other remarks, started calling for her ouster in the spring. The failed bombing on Christmas Day revived those calls. 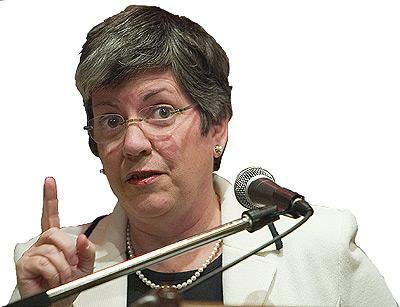 Another wrong decision by Barack Obama to pick Napolitano to this job! From what I see Obama picked people who were unexperienced like himself that he could dictate how to do their assigned job. He didn’t want anyone smarter than himself! I can see why Barack will not release his school records…he was not as good in school as he made the American people think, he could have been given passing grades just to move him up as so many was in the last 15 years which finished high school and couldn’t read or write. From his decisions he sure looks dumb to this American. Opponents have dominated a town hall meeting on whether Guantanamo Bay terrorism suspects should be transferred to a maximum-security prison in rural Michigan. Obama needs to get his head out of the sand and listen to The American People for once! We don’t want to bring home to our soil terrorist that want to kill us!